The Christmas turkey is cold and in sandwiches. A few of us have struggled back to work, carrying surplus chocolate to the office in a desperate attempt to stop our expanding waistlines. Which must mean it's about time to start panicking about what to do on New Year's Eve. Aside from rammed pubs, pricey nightclubs and awkward parties in someone's frontroom, the main focus for London will be squarely on the London Eye. Since the annual drunken nonsense of Trafalgar Square was replaced by Jack Morton WorldWide's fireworks and Christophe Berthonneau's pyrotechnics on the South Bank, images of the Thames and the Eye have led global media coverage on the night - beating Sydney (and Paris) for the first time. Elsewhere, the best partying events will be Norman Jay at The Clapham Grand for a Good Times 'Live' party, cocktails at the Absolut Ice Bar or live Brazilian percussion at Guanabara. If you have yet to see the transformed Festival Hall, head there to catch some Super Furry Animals action. Wherever you end up, public transport will run through the night and will be free between 11.45pm and 4.30am. Full details of the main event are up at http://www.london.gov.uk/newyearseve - if all else fails then you can watch everything on that website, or even sit with those turkey sandwiches and turn on BBC1 from 23.15. 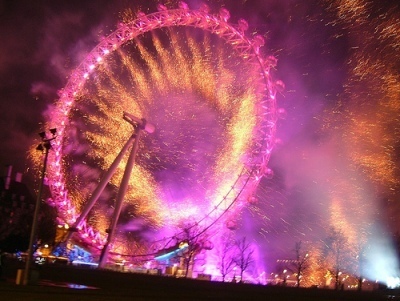 For all the other stuff, head to http://www.visitlondon.com/events/new_year/.